SUMMARY: When upcoming college freshman Elizabeth (aka "EB") gets her Berkeley roommate assignment, she emails the roommate, Lauren, a quiet girl from a large family in San Francisco. At first, the girls seem to have nothing in common, but as the summer goes on, they become unlikely friends. Told partially via email. 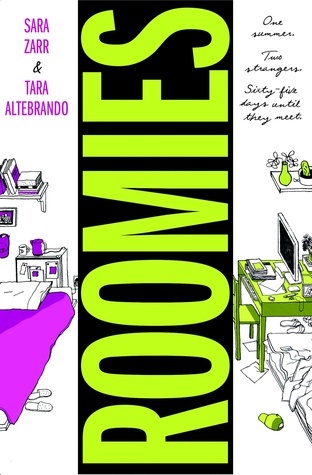 REVIEW: Okay, so it's probably not the most memorable book I'll read this year, but Roomies is a cute, fun Saturday afternoon read that I really enjoyed. Viewpoints alternate between EB and Lauren, and each chapter contains a monologue of what's going on in their lives and ends with an email response to the other roommate across the country. I like that sometimes, the tone of the emails gets misconstrued or misunderstood, which certainly happens in real-life. EB and Lauren are both well-developed, and I like how this was written by two authors to give each girl a voice of her own. There is romance, but it does not overwhelm the plot. The story is the tentative friendship between these two very different girls; while their romantic lives play a part, their relationships are just a piece of the many things going on in their lives. Both girls have family drama and anxiety over leaving the nest, and they find comfort in confiding in someone across the country they have not met yet. I really liked the emphasis on family. Lauren is the oldest of six siblings; all but Lauren is under the age of seven. Lauren has had tons of responsibility thrust upon her, and she cherishes peace and quiet. Elizabeth/EB only has her mother. Her gay father left the family years ago, and she has no siblings. She longs for companionship and feels alone much of the time. Her promiscuous mother flaunts her relationship with a married man in front of EB and allows the man to stay overnight. There are tons of family issues here, and many teen readers will find something to identify with. It's all done realistically and without judgment on the authors' part. Neither girl likes her situation, but with time and communication, they manage to work through it and accept those things they cannot change. THE BOTTOM LINE: Cute, relevant, and easy-to-get-into. Give this to high school girls who want about friendship, family problems, or pre-college anxiety. STATUS IN MY LIBRARY: We don't have it. The girls talk about losing virginity often, and one of the girls does lose her virginity in the story. With 18-year old characters, I think this one is better for high school.